We are very excited to confirm that Margaret Schmidt will be coming from Australia to Auckland to tutor a 3 day workshop. 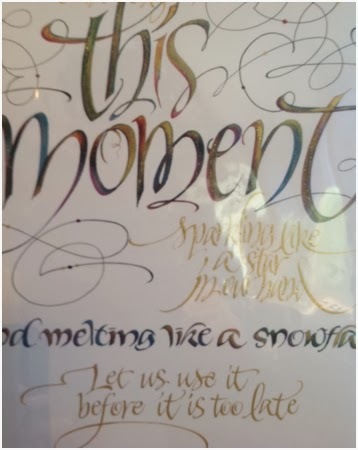 Margaret is a very experienced and talented Calligrapher and the 3 days will be packed with creativity, fun, new techniques and learning. For beginners to experienced, Calligraphers. Day 1 & 2 ‘Creative Calligraphy Cards’ workshop will be all about creating different effects with your lettering, decoration, colour, decorative papers and shapes. A basic foundational or Italic hand will be used. Lots of variation in these 2 days, it will be full on fun!! Suitable for all levels. Day 3 ‘Contemporary Pointed Pen’ this 1 day workshop will be more suited to more experienced calligraphers with an interest in Copper plate or fine nib work.The workshops will be held in Warkworth at Kowhai Art and Craft Centre. We have applied for funding to assist us in bringing Margaret to NZ and should know if we have been successful early April. Therefore, the cost for the workshops will be finalised a bit nearer the time when we have been notified. The cost will be adjusted according to the number of people attending each workshop. Please register your interest ASAP, there will be a close off date of 30 April. A Deposit of $30 will be required to secure your place at the workshops. To register please contact - Gillian Carlsson - email carlssonb@orcon.net.nz - Phone 09 4223740.